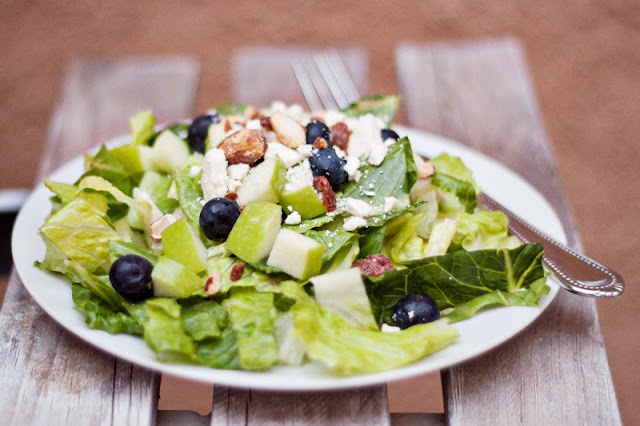 Mustard Me Yellow: Vermont Maple Blueberry Salad. I am absolutely obsessed with this salad! You'll know what I mean once you take a bite. My favorite part about this salad is the maple dressing, or maybe it's the crunch of the cinnamon almonds. My mouth is watering just thinking about it. This salad will make your taste buds dance. 1/4 cup crushed cinnamon almonds (I bought them by the pound at SUNFLOWER MARKET or you can make your own. Click HERE to learn how). Blend all of the dressing ingredients in a food processor or blender until completely smooth. Toss all of the salad ingredients together then drizzle the maple dressing on top right before serving! Taste it, you'll love it! I'm going to have to try this. This was Phil's favorite salad at Zupas, but they don't make it anymore.